One of the projects at the farm this spring was to rebuild the fence around the goat’s spring pasture. This pasture is basically a chunk of the forest, just a short walk past the hayfield. 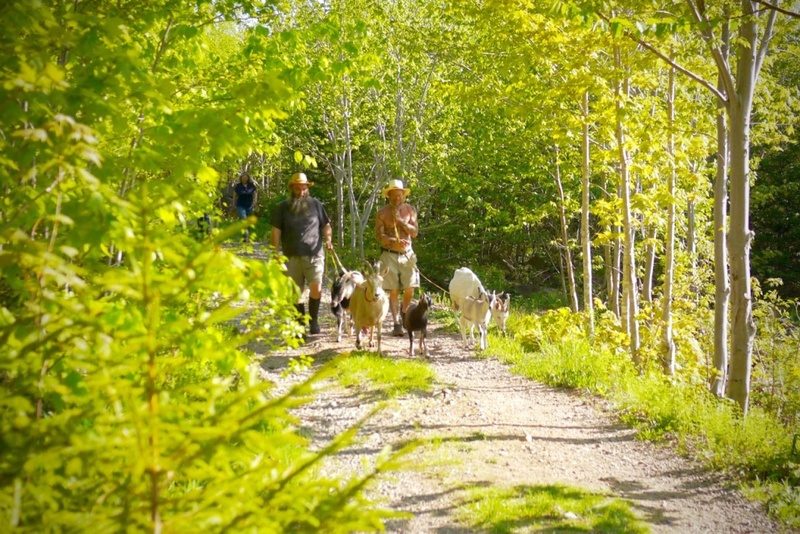 The goats seem to love clambering around the rocky terrain, and eating as much wild food as their many stomachs can hold! Good fences are hard to build on this rocky, mountainous terrain. In most places, you hit ledge no more than a few inches below the soil’s surface, so it’s often next to impossible to get a fencepost sturdy. Added to that, the lay of the land is so rough in spots that it’s often surprisingly easy to nudge the page-wire fence enough for an entire goat to fit through. Goats sure like to play find-the-hole-in-the-fence, especially if they’re determined. 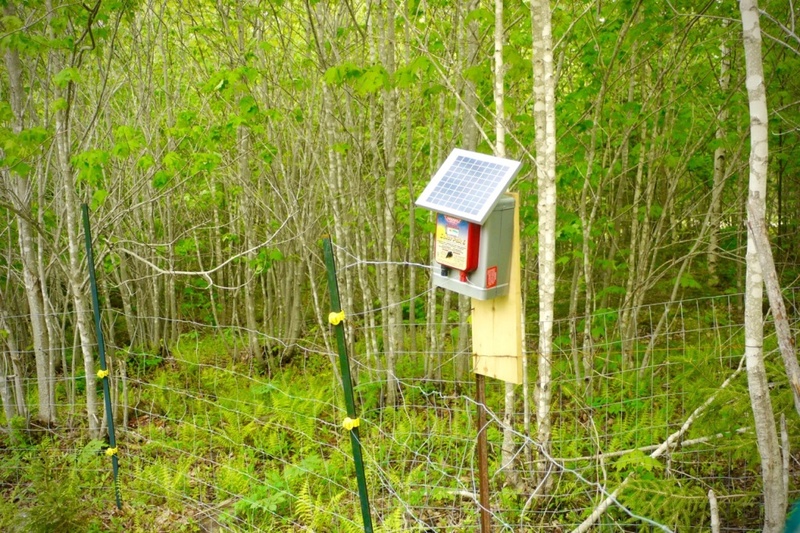 We still have our regular page wire fence, which Laire and Rodney rebuilt and made as sturdy as possible, but inside of that are two strands of electrified wire as well. 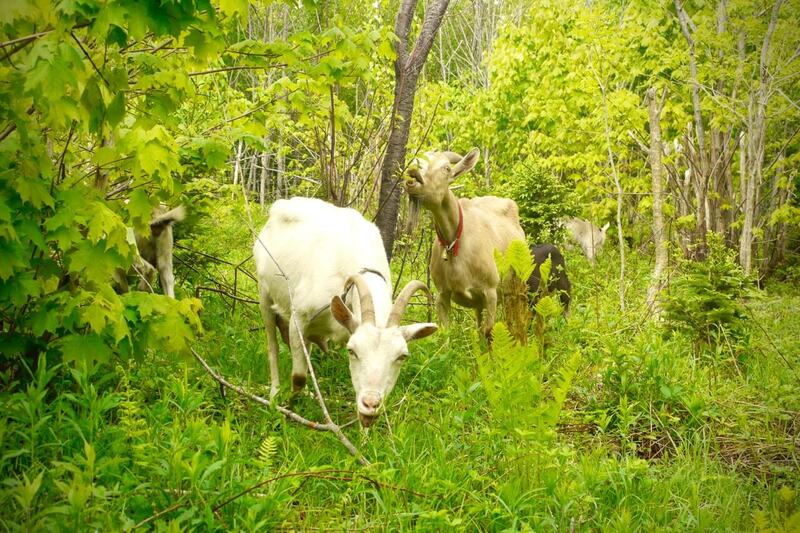 Before letting the goats loose on the pasture, we waited until a substantial amount of foliage had budded out. Bring them here too early, and they might have stripped the vegetation beyond its capacity to regenerate. So far, the fence seems to be working! It’s not fun seeing the goats discover the electric wire for the first time. But now having gotten used to it over the last couple weeks, they’ve learned to avoid it. Now there’s plenty of space for the herd to run around and explore, and forage to fill their bellies, just the way goats ought to live. It’s wonderful to see. By the end of the day, they’re pretty exhausted, and Mocha and Notch look forward to coming back to the barn for milking. The two eagerly lead the farmers and the rest of the herd back home. And there’s more milk at the end of the day than ever. I now really want to make some fiddleheads – going to try your recipe this weekend! Thanks for a great day in NS. Miss you guys but happy to see you’re doing well and happy in beautiful Nova Scotia.